You’ve got termites! Three little words homeowners fear most about their homes. However, we can eliminate any existing termite infestation and protect your home against any future invasion. We treat homes using the two most trusted termiticides on the market: Termidor and Premise. 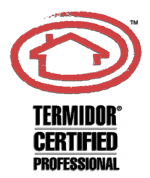 We are a Termidor Certified Professional. Premise, made by Bayer Environmental Science, is a non-repellent treatment that is applied to the soil around your home to create a protection zone. It binds to the soil and won’t wash away. Termites cannot detect the chemical, so they come in contact with the product and then transfer it to other termites by feeding or social grooming. Call our office today for expert termite control services! Termites are small, but they can do a lot of damage! Termites have been found in every state except Alaska and can attack every type of house - brick, concrete, wood, new, old - it doesn’t matter. That means if you live outside of Alaska and own a home, you are susceptible to termite infestations. Each year subterranean termites are discovered in about two million homes across America. Currently termite damage costs are around $1.5 Billion per year and rising!